People are always complaining about ski reviews. “Too short,” they say. “Is this an ad?” Setting aside the fact that the entire process is totally subjective, the problem is that testing skis takes time and testing a lot of skis takes a lot of time—by the time you do it, new skis are out. But fine, have it your way. This in-depth 1,500-plus word ski review is based on four seasons of daily driving at Mammoth Mountain and trips to Silverton, Telluride, Utah, Jackson, and Alaska—hiking, heli skiing, and hillbanging laps off chairlifts in pretty much every imaginable snow/scenario except the snowboard park. No ski has ever been tested this thoroughly for a ski magazine review. One thing I love about skiing compared to most equipment-oriented sports is that anyone can experience the highest-performance skis ever made. I’ll never drive a Ferrari, and even a high-end mountain or road bike is getting near ten grand these days, but I can buy a World Cup-stock Super G ski or one of the best pure big-mountain skis ever made for a few hundred bucks, lightly used and perfectly functional. The Dictator (to cut to the chase) is one of the best pure high-performance big-mountain skis ever made, and a pair can probably be had for about three hundo. Thanks to a 194-centimeter-only size run, the ski didn’t exactly dictate a lot of sales and has since been replaced in the line, but it’s become a low-profile classic. There are newer skis that are somewhat comparable (Blizzard Bodacious? K2 Pinnacle 118? Dynastar Cham 117?) but nothing notably “better” than the Dictator at what it was made for (crushing big terrain and variable snow). Cody Townsend may look creepy when he has a mustache, but he is also very good at skiing fast on large terrain. A few years ago Salomon gave Townsend and fellow specialist Kaj Zackrisson the chance to spec out a competition-style big-mountain crusher, a ski for the maximum-level Alaska-style runs. Designer Laurent Favret wanted to make a no-compromise Formula One-style ski for the application, and the Dictator was the result. What they came up with (and competed and filmed on) was a simplistic ski that has zero notable technology. It’s long, as straight as a rail, flat- and slightly pin-tailed. There may be a little camber underfoot, but my pair is basically flat overall with about a foot of subtle tip rocker. The layup is an extra-stout version of Salomon’s traditional thick cap over a wood core with no metal. Which is good because they are plenty heavy already—especially noticeable in the swing weight. The flex is stiff overall and maybe a little stiffer in the tail, a tad planky for me but I only weigh about 160. The 2012 Salomon El Dictator is sold at garage sales, ski swaps, and Craigslist. So far I’ve gotten at least a couple hundred days of shredding out of my pair. Or I should say Salomon’s pair, because in 2012 I borrowed them from the team manager, thinking they might be good if I made it on a heli in AK, or for big upper-mountain pow days at Mammoth—a specialty ski for scenarios where you could Just Point It. But then I found myself grabbing them more and more often for regular resort days, and skiing them all over the hill. It’s a big, burly ski, but the handling is predictable and accessible, and they’re perfect for the wide-open wind-sculpted terrain and big run-outs at Mammoth. Looking at them leaning on the wall (or picking them up) it’s obvious that the Dictators are not toys. There’s about as much contact length in front of the toepiece as an entire 175 Armada JJ. And about the same again from the toe piece back. When I get back on them after another ski, it feels like there are aircraft carriers on my feet. Used as they were intended (i.e. pointing it on open terrain) the Dictators perform like a super G ski that floats and smears, something made to eat vast swaths of landscape regardless of the snow surface. Even without metal, the straight shape, long contact length, and sheer mass of a 194-centimeter by 114-millimeter plank allows you to just stand up and crush through variable snow knowing that nothing unexpected is going to happen as long as you don’t Freak Out. The ride isn’t silky smooth and ultra-damp, but they’re solid and secure feeling. When they do get deflected, it’s minimal and predictable. The long shovel and slight pintail let you lean way over the front end of the ski for control in choppy seas without worrying about stuffing a tip, and have a similarly beneficial effect on landings. No rocking chair effect here: the tails are burly and they will take you straight down the fall line to Armageddon if you linger too long in the back seat. Thanks to that straight sidecut and flat camber, when you’re in the steeps or up to speed, the big Salomons do the smeary, pivot-y rocker ski stuff that you want, but with no surprises if you lay ’em over into an arc when you’re already cooking (and none of the tip flapping that taints the ride of more than one Big Mountain Ski). If there is a speed limit on this ski, I haven’t found it, and I don’t need to look any harder. Opening them up on a big groomer feels just like a super G ski: same mass, same sidecut, same sensation of momentum and need to start spotting obstacles about a half mile down the run. “Skis hard snow surprisingly well for for a fat ski” is beyond cliché, but the hard snow performance of the Dictator is a big part of the reason they became my everyday ski. Of course the Dictators are too much for tight trees, especially with grabby or punchy snow, where they’re just big, awkward planks that want to spear into things. On a visit to Silverton I felt like The Man whenever there was an opportunity to straight-line a chute into a big, open bowl, but hacking around in the thick lodgepole down low was like parallel parking a bus in the city. Tight spots and a punchy surface are the one time I wish for something shorter, softer, and more rockered. Now that I think about it, I’ve probably adapted to the Dictators by just basically avoiding awkward zones. A billy goat or tree ski this is not. Lift mazes can be a pain too. Where the ski excels is when you’re carrying a lot of energy and need to transition—from going straight to turning, from arcing to skidding, from smearing to pointing it, from pointing it to shutting it down. As long as you’re carrying some momentum or it’s steep enough, you can throw them in and out of full speed-check-hockey-stop mode regardless of the snow surface or what you were just doing. This means you can ski at ridiculous speeds with serene confidence, because you can feather or drift a carved turn and just throw it fully sideways at will—if you’ve got the room. Technical skiers who can get over the front of the ski will find them compliant and easily bent into different size and shape turns, and the straight sidecut lets you put your feet together and wiggle monoski-style when that’s called for (often, if you’re me). Skiers who are used to sidecut doing the work for them will find themselves hurtling toward the trees. “Skis hard snow surprisingly well for for a fat ski” is beyond cliché, but the hard snow performance of the Dictator is a big part of the reason they became my everyday ski. Yes, they’re too wide to feel comfortable on the iciest stuff. But right up to that point, I like them better than the majority of 110-millimeter-plus skis—they’re just really solid and predictable but reactive enough so I don’t feel like I’m flopping a big, dumb powder ski around. I love the smoother feel of skis with metal, but I think that more dampening (and weight) would turn the Dictators into lead sleds—the rebound energy makes them more manageable and versatile than the size and mass would suggest. Where the configuration falters a little is actually in deeper pow, especially at lower speeds. There’s plenty of surface area, but the lack of rocker and a stiff flex means they want speed, the fall line, or snow that pushes back a little: wind buff, crud, coastal powder, etc. Here in Mammoth that’s perfect; if I skied in the Wasatch or Colorado I’d want something softer, shorter, and with more width and rocker in the shovel. Since I basically stole them, I didn’t treat these boards like fine china. They get tossed daily into the truck bed where they live, have been battered in heli baskets, and bashed into a wide variety of things. Over the course of two seasons, I’ve walked on and hit plenty of rocks (including a low-tide trip to Telluride, which is nothing to sneeze at) without anything other than light p-tex work. No delams, no separations. The edges are still thick after a couple of tunes and I have yet to see a core shot. I’m sure a heavier or more abusive skier could crush these just like any other ski, but I’d be a happy customer if I had bought instead of borrowed back in 2012. I give the Dictator three out of three thumbs up for pure functionality and value, and while I wish they also made a 185, I’ve got to respect Salomon for going through the bother of building a truly proper big mountain ski that was never going to sell. 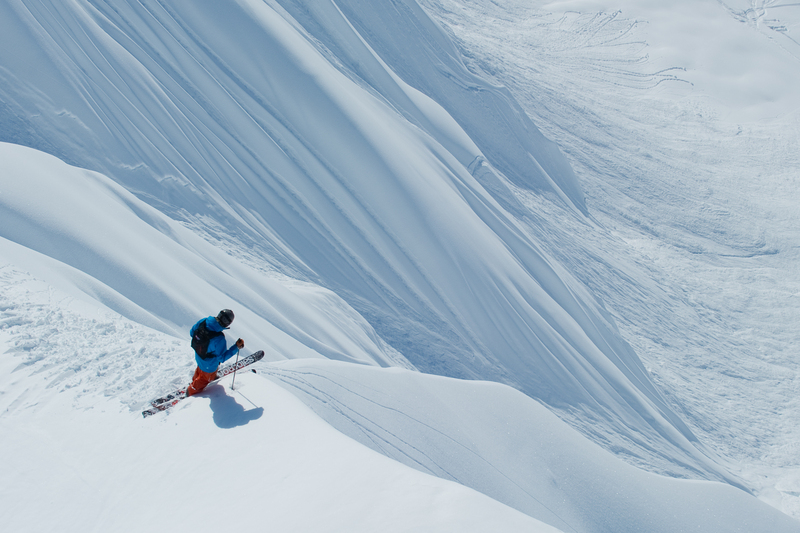 But… skis like this are absurd unless you have true alpine terrain and plenty of vert. And even then they’re almost overkill. If you ski them properly it just makes the mountain small. Which is a fun feeling of power, but it’s limiting in it’s own way—you’re blasting right past terrain you could be milking. It’s not exactly a playful style of skiing. Which is why I’ll probably choose something a little shorter and softer for my next hillbangin’ ski, like a Blizzard Cochise or one of the newer and lighter Salomon skis. And it’s probably no coincidence that Townsend himself is extolling the virtues of lighter, softer, more rockered skis. Regardless, the Dictator is staying in the rotation. They have limitations, but sometimes you just want to Point It. No-compromise big mountain performance. Stable at any speed. Predictable transitions from straightlining to carving to drifting. Crushes almost any snow as long as you have enough room. Great handling as long as you have some velocity. Unpopular and thus cheap on the used market. Would be a stellar ski for big-n-talls. Impressive durability. Brutal in tight trees. Not the best true powder ski. 194-centimeter only. Flex is a little planky unless you’re a large human. Factory tune was edge-high in the shovel and skied like it. Hiking with them on shoulder or pack is a bummer. So much swing weight you will never do a daffy, or for that matter, any trick. Cody Townsend’s creepstache. 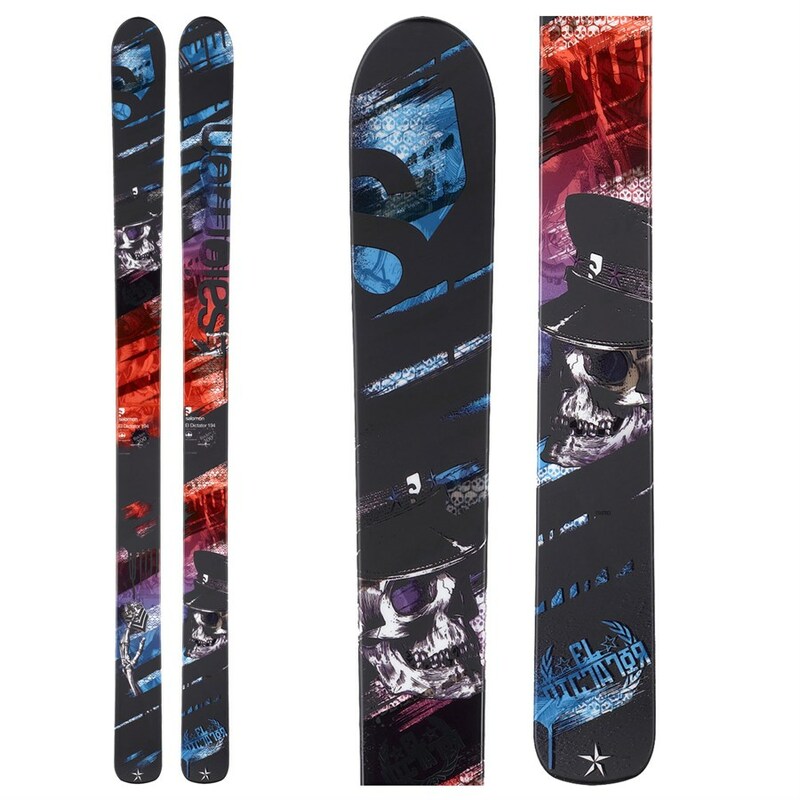 I’ll have my reviews of select 2016 skis in another three or four years.